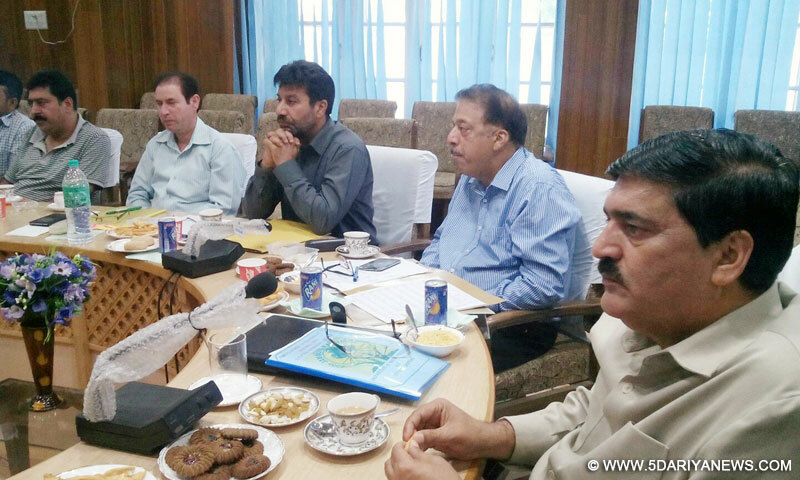 Minister of State for PHE, Forest and Irrigation & Flood Control, Abdul Majeed Padder, today chaired a meeting of officers of Forest Department which was convened here to discuss and review the functioning of the department in South Kashmir.Among others the meeting was attended by Conservator of Forest, South Kashmir, CGM State Forest Corporation, besides DFOs and other district officers of the department.The meeting deliberated on various issues pertaining to the functioning of the department in four districts of South Kashmir and it was given out that department has set the target of 597866 cfts of timber to be provided to the flood affected families of South Kashmir against which 39557 cfts of timber has been dumped at various sale depots in South Circle.The meeting was further informed that target of 519039 cfts of timber has been also set under normal quota of sale against which the 82230 cfts of timber dumped at various sale depots. It was also disclosed that 1153366 cfts of marked timber has been handed over to Social Forestry wing of the department for further necessary action. It was also given to understand that under SRO 103, as many as 533 licenses were issued in favour of primary and secondary unit holders including 351 bandsaw/sawmill/veneer plywood owners and 182 plainer unit holders in south circle.The Minister called upon the officers to work with more zeal and dedication and come up to the expectations of the public. He said that government is committed to the welfare of the people and it is prime responsibility of every functionary to be at the beck call of the people to ensure better public delivery services on ground. He said transparency, accountability and efficiency are the main mantras of the present government and the officers must strive on these parameters, the Minsiter asserted.